The definition of health has evolved over time. In keeping with the biomedical perspective, early definitions of health focused on the theme of the body’s ability to function; health was seen as a state of normal function that could be disrupted from time to time by disease. An example of such a definition of health is: “a state characterized by anatomic, physiologic, and psychological integrity; ability to perform personally valued family, work, and community roles; ability to deal with physical, biological, psychological, and social stress”. Then in 1948, in a radical departure from previous definitions, the World Health Organization (WHO)	proposed a definition that aimed higher: linking health to well-being, in terms of “physical, mental, and social well-being, and not merely the absence of disease and infirmity”. Although this definition was welcomed by some as being innovative, it was also criticized as being vague, excessively broad and was not construed as measurable. For a long time, it was set aside as an impractical ideal and most discussions of health returned to the practicality of the biomedical model. Since the late 1970s, the federal Healthy People Initiative has been a visible component of the United States’ approach to improving population health. In each decade, a new version of Healthy People is issued, featuring updated goals and identifying topic areas and quantifiable objectives for health improvement during the succeeding ten years, with assessment at that point of progress or lack thereof. Progress has been limited to many objectives, leading to concerns about the effectiveness of Healthy People in shaping outcomes in the context of a decentralized and uncoordinated US health system. Healthy People 2020 give more prominence to health promotion and preventive approaches and adds a substantive focus on the importance of addressing social determinants of health. A new expanded digital interface facilitates use and dissemination rather than bulky printed books as produced in the past. The impact of these changes to Healthy People will be determined in the coming years. An increasing number of studies and reports from different organizations and contexts examine the linkages between health and different factors, including lifestyles, environments, health care organization and health policy, one specific health policy brought into many countries in recent years was the introduction of the sugar tax. Beverage taxes came into light with increasing concerns about obesity, particularly among youth. Sugar-sweetened beverages have become a target of anti-obesity initiatives with increasing evidence of their link to obesity. Suchasthe 1974 Lalonde report from Canada; the Alameda County Study in California; and the series of World Health Reports of the World Health Organization, which focuses on global health issues including access to health care and improving public health outcomes,	especially in developing countries. The World Health Organization describes mental health as “a state of well-being in which the individual realizes his or her own abilities, can cope with the normal stresses of life, can work productively and fruitfully, and is able to make a contribution to his or her community”. Mental Health is not just the absence of mental illness. Mental illness is described as ‘the spectrum of cognitive, emotional, and behavioral conditions that interfere with social and emotional well-being and the lives and productivity of people. Having a mental illness can seriously impair, temporarily or permanently, the mental functioning of a person. Other terms include: ‘mental health problem’, ‘illness’, ‘disorder’, ‘dysfunction’. Roughly a quarter of all adults 18 and over in the US are considered diagnosable with mental illness. Mental illnesses are the leading cause of disability in the US and Canada. Examples include, schizophrenia, ADHD, major depressive disorder, bipolar disorder, anxiety disorder, post- traumatic stress disorder and autism. Many teens suffer from mental health issues in response to the pressures of society and social problems they encounter. Some of the key mental health issues seen in teens are: depression, eating disorders, and drug abuse. There are many ways to prevent these health issues from occurring such as communicating well with a teen suffering from mental health issues. Mental health can be treated and be attentive to teens’ behavior. Physical	exercise enhances	or maintains physical fitness and overall health and wellness. It strengthens muscles and improves the cardiovascular system. According to the National Institute of Health (NIH) there are four types of exercise; Endurance, Strength, Flexibilit y, and Balance. Endurance exercises are those that will elevate your heart rate including; walking, jogging, running, hiking etc. Public health has been described as “the science and art of preventing disease, prolonging life and promoting health through the organized efforts and informed choices of society, organizations, public and private, communities and individuals.” It is concerned with threats to the overall health of a community based on population health analysis. The population in question can be as small as a handful of people or as large as all the inhabitants of several continents (for instance, in the case of a pandemic). Public health has many sub-fields, but typically includes the interdisciplinary categories of epidemiology, biostatistics and health services. Environmental health, community health, behavioral health, and healthcare also important areas of public health. The great positive	impact of public health programs is widely acknowledged. Due in part to the policies and actions developed through public health, the 20th century registered a decrease in the mortality rates for infants and children and a continual increase in life expectancy in most parts of the world. For example, it is estimated that life expectancy has increased for Americans by thirty years since 1900, and worldwide by six years since 1990. Personal health depends partially on the active, passive, and assisted cues people observe and adopt about their own health. These include personal actions for preventing or minimizing the effects of a disease, usually a chronic condition, through integrativecare. They	also include personal hygiene practices to preventinfection and illness, such as bathing and washing hands with soap; brushing and flossing teeth; storing, preparing and handling food safely; and many others. The information gleaned from personal observation of daily living – such as about sleep patterns, exercise behavior, nutritional intake and environmental features – may be used to inform personal decisions and actions (e.g., “I feel tired in the morning so I am going to try sleeping on a different pillow”), as well as clinical decisions and treatment plans (e.g., a patient who notices his or her shoes are tighter than usual may be having exacerbation of left-sided heart failure, and may require diuretic medication to reduce fluid overload). Personal health also depends partially on the social structure of a person’s life. The maintenance	of strong social relationships, volunteering, and other social activities have been linked to positive mental health and also increased longevity. One American study among seniors over age 70, found that frequent volunteering was associated with reduced risk of dying compared with older persons who did not volunteer, regardless of physical health status. Another study from Singapore reported that volunteering retirees had significantly better cognitive performance scores, fewer depressive symptoms, and better mental well-being and life satisfaction than non- volunteering retirees. Bangladesh has made significant improvement in health sector, which make it an example for other developing countries even though being a resource poor country. Over the last decades key health indicators such as life expectancy and coverage of immunisation have improved notably, whilst infant mortality, maternal mortality and fertility rates have dropped significantly. Bangladesh stands out as a country that has taken giant steps in healthcare. Long before the emergence of contemporary global health initiatives, the government placed strong emphasis on the importance of childhood immunization as a key mechanism for reducing childhood mortality. The Expanded Programmed on Immunization (EPI) in Bangladesh is considered to be a health system success because of its remarkable progress over the last two decades. It provides almost universal access to vaccination services, as measured by the percentage of children under 1 year of age who receive BCG (a vaccine against tuberculosis). This increased from 2% in 1985 to 99% in 2009. Coverage of other vaccines has also improved substantially. However, poor access to services, low quality of care, high rate of maternal mortality and poor status of child health still remain as challenges of the health sector. Without knowledge concerning health-related issues and the kinds of behaviour that can lead to chronic, incurable conditions, there is no chance of persuading people to change their behaviour. By itself, however, behaviour change won’t happen purely through awareness of potential risks.Health is a dynamic process because it is always changing. We all have times of good health, times of sickness, and maybe even times of serious illness. As our lifestyles change, so does our level of health. In Bangladesh the helth knowledge is very poor. To improve the Health Knowledge of the people we should get some step. That are-To provided Public Health Textbook, which organised in relation to the Faculty of Public Health Part A syllabus but can benefit anyone aiming to increase their public health competencies. Text Courses involve reading provided text and then questions, answers and feedback, in epidemiology, statistical methods, sickness	and health information, population health information, applications of health information at practitioner and specialist levels. Video Courses in the form of audio podcasts with animated PowerPoint slides and supporting video components, Q & As, and further resources. The subjects covered are finding and appraising the evidence, learning from stakeholders, screening, programme budgeting and marginal analysis. Management Training with PowerPoint slides, workbooks, and trainer notes in four clinical areas: diabetes, coronary heart disease, stroke and child health. The study was area-based, cross-sectional and descriptive in nature. Literature review shows that, there was significant study at recent time to show the scenario of Health practice and knowledge in the northern area of Bangladesh. As this part of the country is a peripheral region and is derived from many of the modern facilities and education, our study was aimed to bring about the original scenario of their knowledge and practice regarding health issue. The voluntary interviewer of this study was the student of Department of Pharmacy, Varendra Univesity which is the leading private university of the Northern area of Bangladesh and is situated at Rajshahi, which is the divisional town for the area. The interviewer was to carry the study at her own areas which is one of the major reasons for selecting the study area. 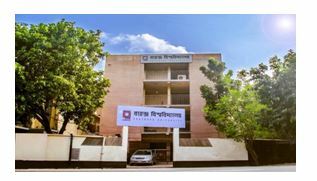 Figure : Varendra University, Rajsgahi. 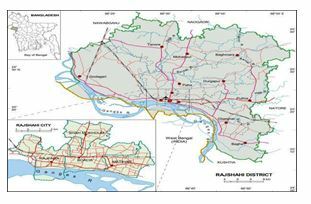 The research involved a qualitative research method approach involving 50 in-depth interviews from the student which maximum home district is Rajshahi and some of them are out of Rajshahi district. The residence of study sample is Rajshahi, Bagmara, Bogra, Chapainawabgonj, Durgapur, Ishwardi, Naogaon, Nator, Pabna, Puthia,Rajabarihat & Sirajgonj. The research methodology used direct interviews and discussion as the primary research instruments. Data were collected from samples whose aged ranged from 18-24 years old. Interviews were chosen as the most appropriate form of data collection. The structured format of the interviews enabled particular contextual themes that contributed to the findings of the study. Field notes taken throughout the research were used to strengthen understandings of particular contexts. Data was collected on April to May 2018. 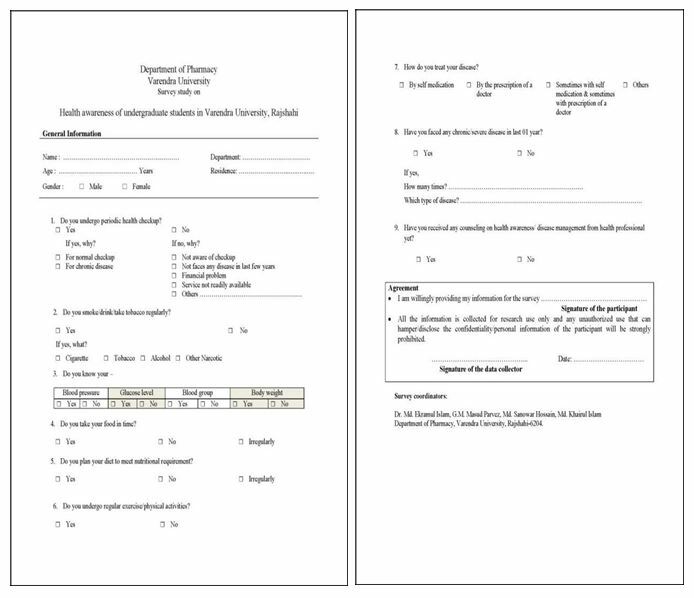 The following format was used to collect the data; all the questions were translated in Bangali while asking to the participants for their easy understanding. All the data collected was used only for research purpose and respondents were assured that, any unauthorized use of the data that can affect the confidentially will be strongly prohibited. All the volunteers participated willingly and their own coast to collect data and interviewed only the willing participants. With written consent as the human subjects only participated in this study, this survey based research did not take any further approval from institution ethics committee. Descriptive statistics were applied to the collected data using Microsoft Excel 2013 software. The following format was sued to collect the data all the questions were translated in Bengali while asking to the participants for their easy understanding. For the purpose of this study we collect data information from the student which maximum home district is Rajshahi. But some of them are out of Rajshahi district. In this report the survey found 32% students residence is Rajshashi city. 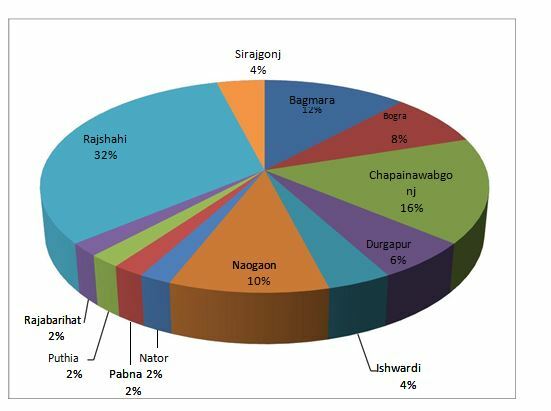 On the other hand from 16% in Chapainawabgonj, 12% in Bagmara, 10% in Naogaon, 8% in Bogra, 6% in Durgapur, 4% in Ishwardi and Sirajgonj, 2% in Nator, Pabna, Puthia and Rajabarihat. In this study report shows that both male and female young people with an age of ≤24 years were interviewed. Data are collected for this study from undergraduate student of “Varendra University”. A total of 750 participants are interviewed with asking the question individually. Data collected from sample whose age range is, age 18-20 is 44% and age 21-23 is 56%. Health is one of the basic requirements for improving in the quality of life. Periodic health checkup is important for young people. Result obtained in this report shows that that maximum sample (66%) don’t take any periodic health checkup. Only a few sample (34%) monitoring its health checkup on a regular basis. The sample which results is “Yes” they go for normal checkup and which result is “No” they not go regular checkup because they not face any disease in last few years. Smoking or drinking or taking tobacco negatively affects mental and physical health. 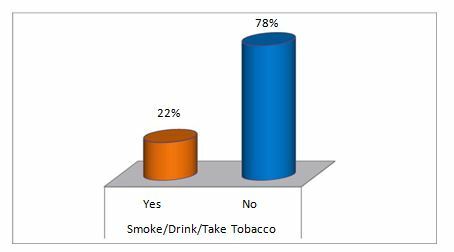 In this report survey areas, found majority of the student sample are 78% not take Smoke/ Drink/ take Tobacco, rest of the student sample are 22% take Smoke/ Drink/ take Tobacco. 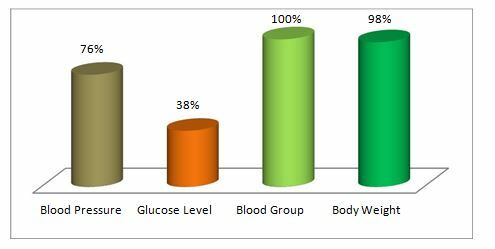 In this result shows that about 76% know there Blood pressure, 38% know there Glucose level, 100% know there Blood group and 98% know their Body weight. Taking regularly food are key factors that impact on the health of young people and a healthy diet and lifestyle can help prevent all chronic disease. 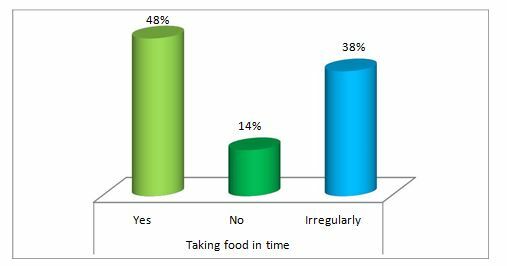 Result obtain in this study report that 48% participants are taking food in time, 38% are taking food irregularly and 14% are not getting food in time. 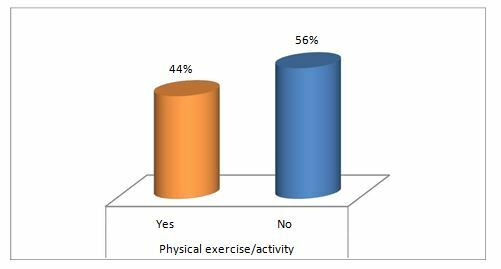 Result obtain in this survey that 44% participants undergo regular exercise or physical activity. 56% participants are not undergoing regular exercise or physical activity. About 8% sample people treat their disease by self medication. 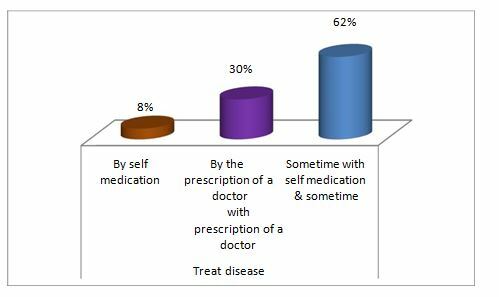 On the other hand 30% people treat their disease by the prescription of a doctor and 62% people follow sometime with self medication & sometime with prescription of a doctor. This study explored health and social status of young people both male and female student of “Varendra University”, Rajshahi. In order to assess the health and social status of the students, they were asked about some health and social related question such as health checkup, smoking habit, process of treating disease, counseling on health awareness etc. Result has obtained in our report that participants of young undergraduate student don’t take any periodic health checkup. Only a few participants undergo periodic health checkup on a regular basis. According to our studies participants who are received periodic health checkup when they have chronic disease like diabetics, heart disease and kidney disease. Participants who don’t take periodic health checkup most of them are not aware about checkup. This result also justified that females are more caring for their external appearance than males. Also, this study showed that there were significant differences in the level of health awareness within the nutrition and body aspects ascribed to the variable of academic specialty, whereas there were no significant differences in the level of health awareness ascribed to the variable of academic specialty within the domain of practicing exercises and personal health. This result can be justified through the nature of courses scientific colleges’ students have compared to the students of literary colleges. The results from this study suggested that the health and wellness course improved students’ knowledge of the Canadian Community Health Survey and public health agencies. Students also indicated that the course was important to their academic program and should be required in the undergraduate program. Interestingly, students showed significant improvement in ratings in their self-assessment of knowledge of physical activity and chronic disease suggesting a positive change in their perceptions and attitudes towards healthy behaviors. Used a cross-sectional mail survey and compared alumni from a college that required all students to take a lifetime health and physical education course to alumni from a college that did not require this type of course. They found that the lifetime health and physical education course did have a positive effect on selected health knowledge; attitudes and behaviors compared to those were not exposed. Specifically, they found that those that took the course were more likely to know their blood pressure, blood cholesterol, and recommended dietary intake, than the comparison group. In addition, the course positively influenced students’ attitudes toward exercise, eating and smoking. While their study had a much larger sample size (n= 979 completed surveys) than the research presented here (n= 35), the results showed similar findings. They found that a course in community health improved the students’ knowledge and positive attitudes towards health promotion and public health. The study revealed that sexual harassment existed in the University of Zambia. Majority of the subjects (71.5%) had knowledge about sexual harassment, whereas 5.8% did not have knowledge about sexual harassment. About 16% of the students were not sure about their knowledge on sexual harassment and 3%of the subjects did not responded to the questionnaire. There was no significant association between the gender and the knowledge about sexual harassment (p=0.27). the present study found that majority of the undergraduate students 336 (82.4%) had average knowledge, 54 (13.2%) had good knowledge and 18 (4.4%) had poor knowledge. A cross-sectional study was conducted by Abeywardene A. et al in Sri Lanka among 242 schoolboys aged 14-19 years from two Colombo district schools to assess the knowledge on sexual harassment and sexual abuse. This study showed a high prevalence of sexual harassment in the schoolboys on par with global figures. The knowledge on sexual abuse was low and on sexual harassment it was extremely low. Only 3.7%had knowledge on sexual harassment. The results of our study showed that a significant number of medical and dentals students were aware that oral squalors cell carcinoma is the most common oral malignancy where squalors cell carcinoma was the most frequently observed oral tumor among Spanish dental students. However; another study conducted among dentists in Italy, one third of them indicated the most common form of oral cancer. The reason of better results could be due to the fact that our study population was 100 students whereas the study conducted in Italy was carried out amongst 1000 dentists which is comparatively a larger sample size. In the present survey, dental students were more likely to identify tobacco and alcohol as main risk factors for oral cancer than medical students These findings are consistent with reports from Iran, Spain, UK, and in a study among doctors and dentists from North East of England.16 The reason for this could be that dental students are more well informed about oral cancer. [109, 111, 112, 113] Health is an important aspect of human life. As age progress virtually young both male and female undergraduate university student suffer from some different types of health problem due to the health awareness. Health education establishes People’s awareness, skills, and encourages them to adopt positive attitudes towards their wellbeing. Health education raises students’ knowledge about physical, mental, emotional and social health. It motivates youth to improve and maintain their health, prevent diseases, and avoid unhealthy behaviors. Health education extends the inspiration and motivation towards the first crucial aspects of life sustenance, maintenance and improves the productivity and standard of living of people around the globe. Knowledge and experience are necessary, but attitude to students and teaching skills are important too. Result has obtained in our report that participants of young undergraduate student don’t take any periodic health checkup. Only a few participants undergo periodic health checkup on a regular basis. According to our studies participants who are received periodic health checkup when they have chronic disease like diabetics, heart disease and kidney disease. Participants who don’t take periodic health checkup most of them are not aware about checkup. This result also justified that female student are more caring for their external appearance than male student. Smoking or drinking or taking tobacco negatively affects mental and physical health. Result shows that most of students are out of smoking habit. Blood group and Body weight is known to all but maximum student not knowing about their Blood pressure and Glucose level. Taking regularly food are key factors that impact on the health of young people and a healthy diet and lifestyle can help prevent all chronic disease. Only 50% percent student aware about their food habit. A little amount of student treats their disease by self medication, maximum student are follow sometime with self medication & sometime with prescription of a doctor. But before take any step to treat disease, it is necessary to counseling on health awareness from health professional. Health is an important aspect of human life. As age progress virtually young both male and female undergraduate university student suffer from some different types of health problem due to the health awareness. World	Health Organization. (2006). Constitution of the World Health Organization – Basic	Documents, Forty- fifth edition, Supplement, October 2006. Jadad AR and O’Grady L. “How should health is defined and how should health be defined?” BMJ 2008; 337: a2900. Doi: 10.1136/bmj.a2900. PMID 19073663. Callahan D. “The WHO definition of ‘health’”. The	Hastings	Center Studies.1973; 1 (3):77–87. Doi: 10.2307/3527467. JSTOR 3527467. Taylor S and Marandi A. “How health should be defined?” BMJ. 2008; 337: a290. Doi:.10.1136/bmj.a290. PMID 18614520. Bellieni CV and Buonocore G. “Pleasing desires or pleasing wishes? A new approach to	pain definition”. Ethics Med. 2009; 25 (1): 7. Sport, Disability and an Original Definition of Health. Zenit.org (February 27, 2013). Stokes J and Noren J, et al. “Definition of terms and concepts applicable to clinical preventive medicine”. Journal of Community Health. 1982; 8 (1): 33– 41. Doi: 10.1007/bf01324395. ISSN 0094-5145. PMID 6764783. World Health Organization (1958). The first ten years of the World Health Organization. Geneva: WHO. “Part 1 – Theory: Thinking About Health Chapter 1 Concept of Health and Illness”. Phprimer.afmc.ca. Retrieved 2016-06-22. World Health Organization. Regional Office for Europe (1984). Health promotion: a discussion document on the concept and principles: summary report of the Working Group on Concept and Principles of Health Promotion, Copenhagen, 9–13 July 1984 (ICP/HSR 602(m01)5 p). Copenhagen: WHO Regional Office for Europe. Benz, J; Blakey, C; Oppenheimer, C. C; Scherer, H; Robinson, W. T (2013). “The healthy people initiative: Understanding the user’s perspective”. Journal of Public Health Management and Practice. 19 (2): 103–9. Doi:10.1097/PHH.0b013e318254cc31. PMID 23358287. Jonathan, E. Fielding; Shiriki, Kumanyika; Ronald, W. Manderscheid (2013). “A Perspective on the Development of the Healthy	People 2020 Framework for Improving U.S. Population Health” (PDF). Public Health Reviews. 35. Archived from the original on 2014-04-02. Simandan, D., “Rethinking the health consequences of social class and social mobility”.SocialScience& Medicine. 2017; 11.037. World	Health	Organization. The determinants of health. Geneva. Accessed 12 May 2011. Lalonde and Marc (1974). “A New Perspective on the	Health of 26 Canadians.” Ottawa: Minister of Supply and Services. Archived 2014-10-28	at the Wayback Machine. Andreyeva and Tatiana, et al.”Estimating the potential of taxes on sugar-sweetened beverages to reduce consumption and generate revenue”. Preventive Medicine. 2011; 52 (6): 413–416. Doi:10.1016/j.ypmed.2011.03.013. Housman and Jeff, et al. “The Alameda County Study: A Systematic, Chronological Review” (PDF). American Journal of Health Education. Reston, VA: American Alliance for Health, Physical Education, Recreation and Dance. 2005; 36 (5): 302 308. Doi:10.1080/19325037.2005.10608200. ISSN 1055-6699. ERIC document number EJ792845. Retrieved 27 December 2011. World Health Organization. The world health report. Geneva. Bos, E.H.; Snippe, E.; de Jonge, P.; Jeronimus, B.F. (2016). “Preserving Subjective Wellbeing in the Face of Psychopathology: Buffering Effects of Personal Strengths and Resources”. PLoSONE. 11 (3):e0150867. D oi:10.1371/journal.pone.0150867. PMID 26 963923. “Mental Health and Teens: Watch for Danger Signs”. HealthyChildren.org. Retrieved 2014-03-01. “Healthy Eating: “Why should I make healthy food choices?”. Livelifewell.nsw.gov.au. Archived from the27 original on 2014-02-27. Retrieved 2014-03-01. “4 Types of Exercise”. Go4Life. 15 May 2014. Pilkington, Stephanie (August 7, 2013). “Causes and consequences of sleep deprivation in hospitalized patients”. Nursing	Standard. RCN Publishing. 27 (49):35–42. Doi:10.7748/ns2013.08.27.49.35.e7649. PMID 23924135. Retrieved 25 November 2015. Shilo Rea (2015-08-31). “New Research Confirms Lack of Sleep Connected to Getting Sick”. Cmu.edu. Retrieved 2015-11-25. Patel, Sanjay R.; Hu, Frank B. (January 17, 2008). “Short sleep duration and weight gain: a systematic review”. Obesity (SilverSpring). 16(3): 643–653. Doi: 10.1038/oby.2007.118. PMC 2723045 PMI D 18239586. “IARC Monographs Programme finds cancer hazards associated with shiftwork, painting and firefighting”. International Agency for Research on Cancer. December 5, 2007. Retrieved November 25, 2015. Hirshkowitz, Max; Whiton, Kaitlyn; et al. (14 January 2015). “National Sleep Foundation’s sleep time duration recommendations: methodology and results summary”. Sleep Health: Journal of the National Sleep Foundation. Elsevier Inc. 1: 40–43. Doi: 10.1016/j.sleh.2014.12.010. Retrieved 25 November 2015. Winslow CE (1920). “The Untilled Fields of Public Health”. Science. 51 (1306): 23– 33. doi:10.1126/science.51.1306.23. PMID 17838891. Association of Schools of Public Health. Impact of Public Health. Retrieved 2010-6-24. World Health Organization. Life expectancy at birth, accessed 20 April 2011. Robert Wood Johnson Foundation.(2008). Health in Everyday Living. Harris AH, Thoresen CE (2005). “Volunteering is Associated with Delayed Mortality in Older People:Analysis of the Longitudinal Study of Aging” (PDF). Journal of Health Psychology. 10 (6): 739–52. Doi:10.1177/1359105305057310. PMID 161769 53. Archived from the original (PDF) on 2011-07-22. Schwingel A, Niti MM, Tang C, Ng TP (2009). “Continued work employment and volunteerism and mental well-being of older adults: Singapore longitudinal ageing studies”. Age and Ageing. 38 (5): 531– 7. Doi:10.1093/ageing/afp089. PMID 19474036. Health Systems in Bangladesh by Shakeel Ahmed Ibne Mahmood. 2012; Vol. 1 No. 1:1 doi: 10.3823/1100. Ferdous Arfina Osaman. “Health Policy Programmes and System in Bangladesh”. Achievements and Challenges. South Asian Survey.2008; P 263-288. Saka M. J., Isiaka S. B., Akande T. M., Saka A. O., Agbana B. E.and Bako I. A (2012). Health related policy reform in Nigeria: Empirical analysis of health policies developed and implemented between 2001 to 2010 for improved sustainable health and development. Journal of Public Administration and Policy Research. Available at: http://www. academicjournals.org/JPAPR/abstracts/abs tracts/abstracts2012/April/ Saka%20et%20al.htm. Accessed on May 15, 2012. Mahbubar Rahman.(2012). “Rajshahi District”. In Islam, Sirajul; Jamal, Ahmed A. Banglapedia: National Encyclopedia of Bangladesh (Second ed.). Asiatic Society of Bangladesh. “Pabna, Rajshahi were freed two days after final victory”. The Daily Star. 2013-12-18. Retrieved 2018-01-07. “’Pir’ killed in Rajshahi”. The Daily Star. 2016-05-08. Retrieved 2018-01-07. Ansari WI and Stock C, et al. “HEALTH PROMOTING BEHAVIOURS AND LIFESTYLE CHARACTERISTICS OF STUDENTS AT SEVEN UNIVERSITIES IN THE UK”, Cent Eur J Public Health, 2011; 19 (4): 197–204. Khan SJ and Anjum Q, et al. “Awareness about Common Diseases in selected Female College Students of Karachi”, JPMA, 2005; 55:195. Kempen EL and Muller H, et al. “A study of the relationship between health awareness,lifestyle behaviour and food label usage in Gauteng”, S Afr J Clin Nutr, 2012;25(1):15-21. Mamdouh M. Ashraah and Ahmad M. Mahasneh, et al. “Health Awareness among University Students in Jordan”, Canadian Center of Science and Education, 2013; Vol. 5, No. 5; ISSN 1918-7173. E-ISSN 1918-7181. Imran M and Sayedalamin Z, et al.“Knowledge and Awareness of Colorectal Cancer among Undergraduate Students at King Abdulaziz University, Jeddah, Saudi Arabia: a Survey-Based Study”, Asian Pacific Journal of Cancer Prevention, 2016;Vol 17(5), 2479-2483. Ann Hagell. “AN OVERVIEW OF RESEARCH ON KEY ISSUES IN STUDENT HEALTH”, Association for Young People’s Health, 2017. Reichel KF and Spehar N, et al. “THE LEVEL OF PHYSICAL ACTIVITY OF UNDERGRADUATE STUDENTSAT THREE FACULTIES OVER A SEVEN- DAY PERIOD”, 7th International Scientific Conference on Kinesiology, 2014, Opatija, Croatia. Tapera Chiwocha Jr. “Lifestyle Awareness in Health Conservation: Aspects in Diet, Exercise, and Self-Perception”, MD Candidate 2016. Amorha KC and Jiburu EM, et al. “Cigarette Smoking Prevalence and Awareness amongst Undergraduate Students of the University of Nigeria”, Nsukka. J Basic Clin Pharma 2017; 8:239-244. Lapointe L and Ramaprasad J, et al. “Creating health awareness: a social media enabled collaboration”, Health Technol 2014; DOI 10.1007/s12553-013-0068-1. Usha Kuruganti. “The Impact of a Required Undergraduate Health and Wellness Course on Students’ Awareness and Knowledge of Physical Activity and Chronic Disease”, University of New Brunswick 2013-001. Tellier PP and DiGenova L. “STUDENT HEALTH AT MCGILL UNIVERSITY”, A REPORT OF THE FINDINGS FROM THE 2013 NATIONAL COLLEGE HEALTH ASSESSMENT. Jon Williamson. “Awareness of Physical Activity Health Benefits can Influence Participation and Dose”. Sports Med Rehabil J. 2016; 1(1): 1003. Khaldoun M. Aldiabat1and Nasir A. Matani, et al. “Mental Health among Undergraduate University Students: A Background Paper for Administrators, Educators and Healthcare Providers”, Universal Journal of Public Health 2(8): 209-214,2014;DOI:10.13189/ujph.2014.020801. Singh J and Begum D, “Student Awareness of Health Information Initiatives of the Governments of India and Bangladesh”, WORLD LIBRARY AND INFORMATION CONGRESS: 76th IFLA GENERAL CONFERENCE AND ASSEMBLY; 2010, Gothenburg, Sweden. Omobuwa O	and Alebiosu OC. “Awareness of diabetes	amongst undergraduates in a Nigerian University,29 South West Nigeria”,Sahel Med 2014; 17:29-33. Gurung A and Priyadarshini S, et al. “Knowledge of Sexual Harassment among the Undergraduate students in Udupi district”, NUJHS 2016; Vol. 6, No.2, ISSN 2249-7110. Al Junaibi RM and Khan SA. “Knowledge and Awareness of breast cancer among university female students in Muscat, Sultanate of Oman”, Journal of Applied Pharmaceutical Science 2011; 01 (10): 146-149. Waheed Z and Saeed M. et al. “Awareness and Practices of Oral Hygiene among Female Undergraduates in a Malaysian University”, Journal of Education and Educational Development 2017; Vol. 4 No. 2. Melinda M. Varhegyi and Denise M. Jepsen.“UNDERGRADUATE STUDENT ASPIRATIONS, AWARENESS AND KNOWLEDGE OF POSTGRADUATE STUDY OPTIONS” IERA 2009 17th Annual Conference July 2009, Bangkok; ISBN 978-0-9750131-9-9. Rehman S and Khan M. “AWARENESS OF ORAL CANCER IN UNDERGRADUATE MEDICAL AND DENTAL STUDENTS”, Pakistan Oral & Dental Journal 2013; Vol 32, No. 3. Stewart-Brown S and Evans J, et al. “The health of students in institutes of higher education: an important and neglected public health problem”. J Public Health Medicine 2000; 22(4) 492-9. Sapkota S and Bowles HR, et al. “Adult participation in recommended levels of physical activity – United States, 2001-2003”. MMWR Morb Mortal Wkly Rep. 2005; 54: 1208-1212. Centers for Disease Control and Prevention (CDC). Behavioral Risk Factor Surveillance System Survey Data. Atlanta, Georgia: U.S. Department of Health and Human Services. J Am Geriatr Soc. 2008. King DE and Everett CJ, et al. “Healthy Lifestyle Habits in US Adults, 1988-2006”.J Med. 2009; 122: 528-534. Marshall SJ and Jones DA, et al. “Race/ ethnicity, social class, and leisure-time physical inactivity”. Med Sci Sport Exerc. 2007; 39: 44-51. Pan L and Galuska DA, et al. “Differences in prevalence of obesity among black, white, and Hispanic adults, United States 2006-2008”. MMWR Morb Mortal Wkly Rep. 2009; 27: 740-744. Wilson DK and Kirtland KA, et al. “Socioeconomic Status and Access and Safety for Physical Activity”. Ann Behav Med. 2004; 28: 20-28. “Hypertension.” Centers for Disease Control and Prevention. Usa.gov. 30 May 2013. (http://www.cdc.gov/nchs/fastats/hyprtens. htm). SaravananCandHeidhyI.“Psychological problems and psychosocial predictors of cigarette smoking behavior amongundergraduatestudentsin Malaysia”. Asian Pac J Cancer Prev 2014;15:7629-34. Pearman S and Valois R, et al “The impact of a required college health and physical education course on the health status of alumni”.Journal of American College Health 1997; 46, 77 – 85. Menon A and Shilalukey N, et al. “University students’ perspective of sexual harassment: a case study of the University30 of Zambia”. Medical journal of Zambia 2009; 36(2). Abeywardene A and Atukorale S, et al. “A study on knowledge and prevalence of sexual harassment and abuse among schoolboys in Colombo District”. Sri Lanka Journal of Chilf health 2004; 33: 9-17. Almas K and Al-malik, et al. “The knowledge and practices of oral hygiene methods and attendance pattern among school teachers in Riyadh, Saudi Arabia”. Saudi Med J 2003;24(10), 1087–1091. Sourabha K.G and Jacob J, et al. “Knowledge , attitude , and practices of oral hygiene among college students in Bengaluru city”. 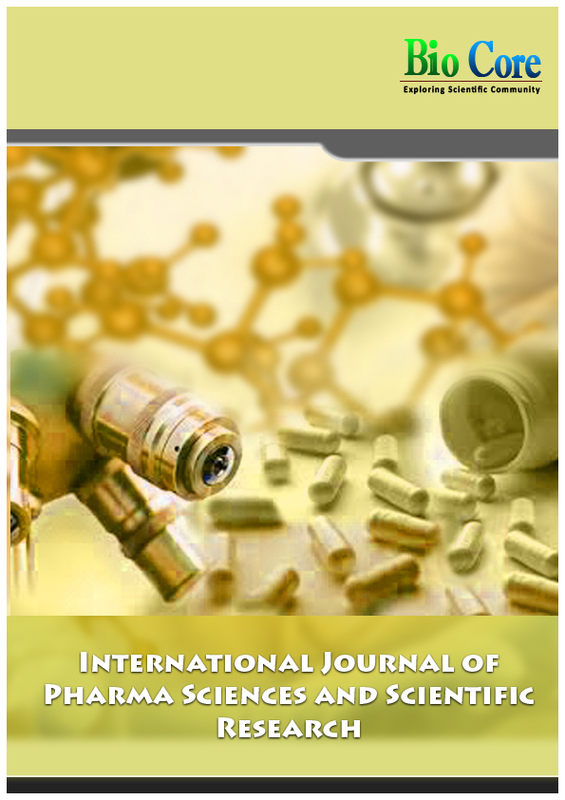 Journal of Indian Association of Public Health Dentistry 2016; 14, 75–79. Mudathir M and Awooda. “Knowledge and Attitude about Tooth Decay and Practice towards Oral Health Education at Khartoum Province- Sudan”. Sudan Journal of Medical Sciences 2003; 8(2). Khan M and Salam A, et al. “Niswar as a risk factor in the aetiology of oral cancer”. J Pak Dent Assoc Apr - Jun 2007; 16(2):77-81. Jaber MA and Diz Dios P, et al. “Spanish dental students’ knowledge of oral malignancy and premalignancy”. Eur J Dent Edu 1997 Nov; 1(4): 167-71. Colella G, Gaeta GM, et al. “Oral cancer and dentists: Knowledge, attitudes, and practices in Italy”. Oral Oncology April 2008 44(4): 393-99. Ogden GR and Mahboobi N, et al. “Oral cancer awareness among undergraduate medical and dental students in Iran”. Journal of cancer education 2011; 26(2): 380-85.
. Carter LM and Ogden GR. “Oral cancer awareness of undergraduate medical and dental students”. BMC Med Edu. 2007; 7:44. Greenwood M and Lowry RJ. “Oral cancer:primarycareClinician’s knowledge of oral cancer: a study of dentists and doctors in North East of England”. BDJ 2001; 191: 510-512.